BUGGY ROLLIN videos 2012 had major events. First World Speed Record 126kmh video. We made the speed record synchronized with Stern TV show. That was the highlight of the show. We went very early in the morning as every one is sleeping to prepare the runs. We did it with the firsts rays of sun. We used a mix of Golden BUGGY ROLLIN suit and Blue Aramis because of secret technical reasons. It was scary and not easy. Peaceful mind control is one of the key to success. 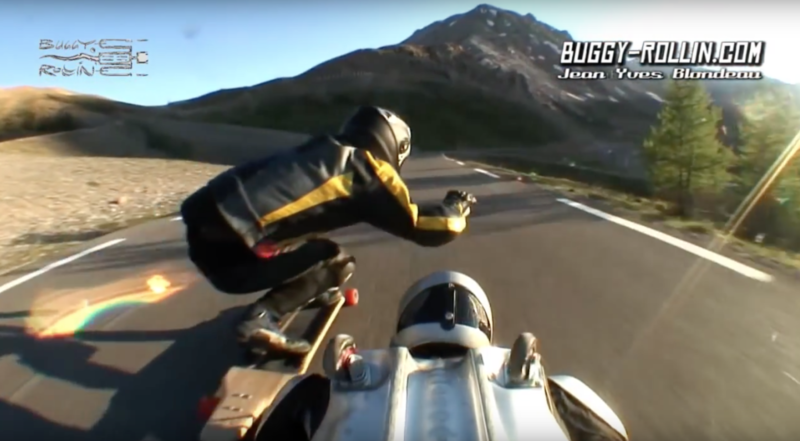 Danny Strasser film maker, Franck Bonnefoy legendary downhill long boarder, and Jean Yves Blondeau, the Rollerman, went together on a road trip in the alps at the quest of some perfect downhill. One of the results is a very nice video with beautiful red sun nice green mountain forests on endless roads. we can see many time the long boarder pushing on the body of Jean Yves in order to gain speed. That was because the BUGGY ROLLIN suit was more dynamic and had to wait for the longboard in order to stay together in front of the camera. China organized one of the the biggest event Jean Yvves Blondeau, The Rollerman, ever took part in matter of number of spectators. 230 millions of spectators live on TV. The same day, the TV program had been broadcast in almost all the countries of the world. That for the total number of spectators in at lest one billion. The mountain was very nice, the road was insane, and Jean Yves very alone. Chupa Chups Russian 4XL CF. Jean Yves was performing BUGGY ROLLIN for the commercial film of an extra big lolly pop with 4 layers of different taste and texture. The movie was made in moscow between two rain shower in only one day. It is an absolute record of efficiency.